With tens of thousands of credentialed journalists descending on Cleveland and Philadelphia in 2016 and Tampa and Charlotte in 2012 to cover the Republican and Democratic National Conventions, getting around required a transportation partner with logistics finesse. To ensure the convenience, productivity and safety of hundreds of its staffers, on-air talent, executives and guests, this global news organization’s Corporate Travel Services team selected WeDriveU to manage ground transportation. 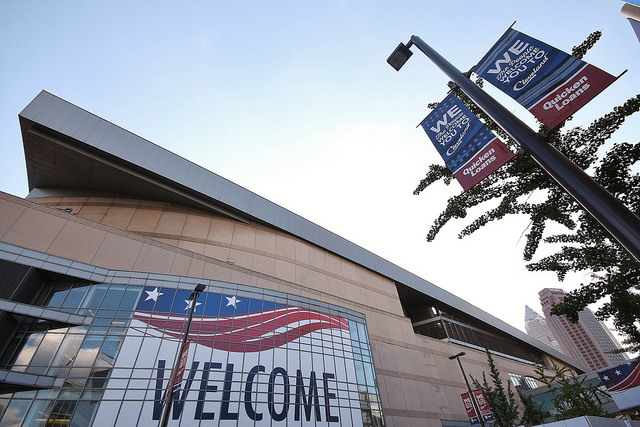 The complexities of delivering real-time reporting and information at national political conventions are immense: scouting offices and set locations; arranging travel, housing and dining; rigorous schedules with last-minute venue changes; security zones and road closures. Connecting all these moving pieces requires a robust ground transportation plan from the experts at WeDriveU. This client’s Travel Services team wanted a comprehensive and cost-effective approach to transport anchors, correspondents, guests, executives, production crews and equipment between airports, the network’s convention headquarters, convention centers, hotels and other venues. An important factor in selecting WeDriveU was its 25+ year track record serving campaigns and dignitaries at high-profile events, including outstanding service for clients at the 2004 and 2008 conventions. WeDriveU’s Meeting Services team handled all ground transportation for the events, including driver staffing, route planning, fleet management, dispatching, customer service and contingency plans. In the months leading up to the conventions, WeDriveU provided strategic input on transportation aspects in the client’s event plans for both cities based on analyzing the client’s goals, venue logistics, schedules and passenger profiles. WeDriveU refined each plan based on site reconnaissance, route dry runs and alerts from the Host Committees and law enforcement agencies regarding security and demonstration zones, parking and road closures. In the case of 2012, with days to go, WeDriveU advised on contingency plans for Hurricane Isaac in Tampa, creating a ground transportation evacuation plan for employees on-site at the RNC. During the conventions, WeDriveU coordinates with the client’s ground teams; staffing experienced transportation managers, call center representatives and professional drivers, including those with law enforcement experience. During the 2012 conventions, WeDriveU provided meet and greets for passenger arrivals at commercial and executive airports by monitoring manifests, travel itineraries and flight updates from airlines and handlers. Drivers transported VIPs and staff between airports and the St. Petersburg Times Forum and Time Warner Cable Arena and Bank of America Stadium in Charlotte, North Carolina, plus hotels, team headquarters, press conferences and other local event venues. WeDriveU’s analytics and reporting played a key role in the success of these events. The team combined real-time insights from GPS tracking and other operational systems with direct communication between drivers, managers and customer care representatives to deliver passengers to their locations on time, every time.